In Florida, a Will must have certain requirements to be valid. The testator must sign the Will document in the joint presence of two attesting witnesses, and the at the time the will is signed the testator must have the present ability and intent to make the Will. While these requirements seem rather simple, there is still a lot of litigation in this state over Wills. This litigation often occurs because many wills are poorly written and contain ambiguous language, and it can be unclear exactly how a court should administer a Will. It could be the case that a court could interpret a Will in multiple ways, and this interpretation could seriously change what assets the beneficiaries receive. In Florida, a beneficiary may need a Will construction if a court finds the Will to be so ambiguous that a court must determine the testator’s intent. This type of proceeding is known as an adversary, which means the moving party must give formal notice of the action to every interested party unless the court orders otherwise. This type of action is conducted like a civil trial and is quite formal, which means Florida’s rules of evidence will apply. Who wins a will construction contest often depends on the extrinsic evidence presented in the case. Extrinsic evidence, also known as parol evidence, is usually not allowed under Florida law, which means the Florida probate courts will typically only consider the language of the actual Will document. An example of extrinsic evidence might be emails sent back and forth between two parties before the testator created the Will. If the words contained in a will when applied to a bequest or devise would apply to several people or items. A court will allow extrinsic evidence when those three scenarios apply. Either party to prove or contract an interpretation of the Will with this type of evidence. The main reason a probate court allows this evidence is because the court hopes to solve the ambiguity by finding the testator’s intent. The court often places itself in the position of the person who created the document (the testator), and will act as close to this intention as possible. In the case of Garcia v. Celestron, the court had to determine ambiguity in the language of Garcia’s Will. This language was determined to be ambiguous because it could be interrupted to mean that Mercy had received either a life estate or a life estate determinable. If the language had created a life estate, then Mercy would have the option to live or not live in the house for the rest of her life. If the language created a life estate determinable, then Mercy could live in the house, but if she ever moved out the house would be sold. The Court allowed both parties to present parol evidence to determine the testator’s intent. The Court found Mercy did not love in the house but rented it out to tenants, and Mercy had never intended to live in the house. The Court determined the testator’s likely intent was to allow Mercy to live in the house and then to sell the property when she moved out. The beneficiaries would then equally divide the proceeds from the sale. If you need help with the Jacksonville Probate for a family member or someone in Florida Contact us. 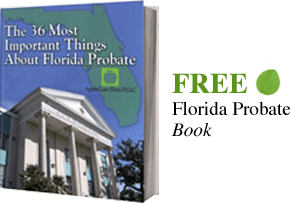 Additionally, if you feel something is wrong with the way a Florida Probate is being handled, Contact our Jacksonville Probate Lawyers by email or call us at 904-685-1200 to discuss your situation today.